Melting Pot for Concrete Testing - Used to melt Capping compound this pot comprises a metal container in a well lagged steel jacket. A thermostatic control and stand by heat switch are fitted. Supplied complete with lift off cover. Warmer : An electrically heated and thermostatically controlled bath for melting the capping compound. Supplied with cover and handle. Suitable for operation on 230 Volts A.C. Single Phase. Capping Compound : Used for capping the ends of concrete cylinders to be tested. Available in packs of 5 kg. Bowl & Ladle : Metallic bowl is used to carry the capping compound and ladle is used to pout molten capping compound in to the groves between specimen and capping plate. Supplied as a set. Dimensions (Diameter x Depth) Internal: 140 x 150mm External: 250 x 165mm Capacity: 2.4 Litres Rated Power: 750 W Temprature: 40 to 3400C. We are leading manufacturers, suppliers & exporters of Melting Pot For Testing Lab for Concrete Testing Lab. 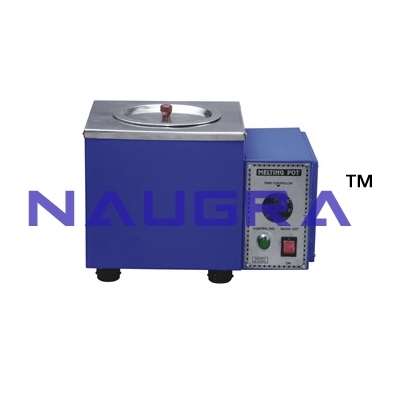 Contact us to get high quality designed Melting Pot For Testing Lab for Concrete Testing Lab for schools, colleges, universities, research labs, laboratories and various industries. We accept bulk orders for government tenders in all countries around the globe.